Frozen Drink Freezing Cylinder One, 3.5 quart (3.3 liter) capacity. 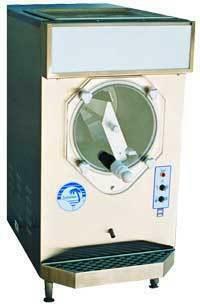 Frozen Drink Mix Hopper One, 8.5 quart (8.0 liter) capacity. Refrigeration Unit Internally mounted condensing unit. Electrical Standard is 115V/60Hz/1Ph. 10.0 total amps with a 15-amp cord. Optional is 220V/60Hz/1Ph. 5.0 total amps with a 20-amp cord. * Please call us for any questions on our frozen drink machine rentals in Sulphur LA, serving Southwest Louisiana.